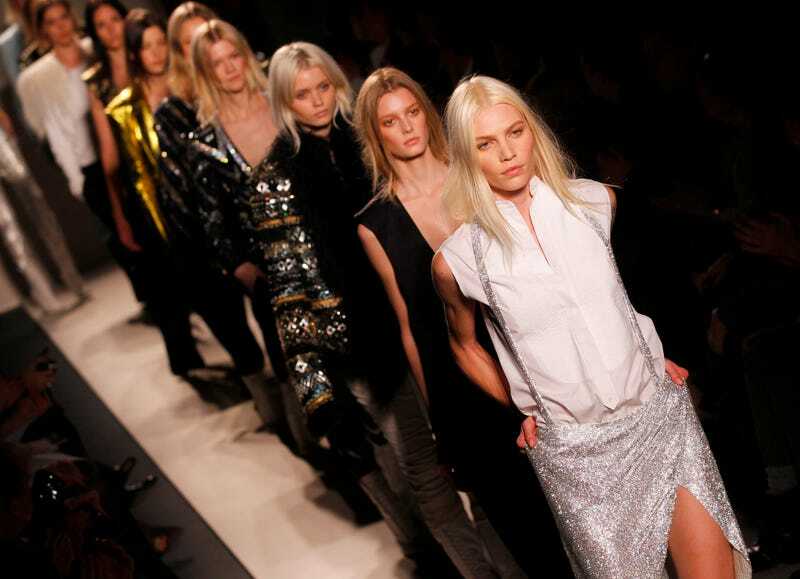 The big news about today's Balmain show is that the designer, Christophe Decarnin, was MIA. Apparently he was tired. No wonder, after staring at this bejeweled, shiny, daughter-of-a-rock-star-goes-to-construction-site collection. Some of the collection was made up of sharp, 90s-inflected tailoring. These were paired with "workboot"-"inspired" "shoes." The sequins were laid on with a heavy hand, as one would expect from the ever-flashy designer. And there were allusions to antique menswear throughout. And in a brand known for party-ready frocks, he didn't skimp on the minis.